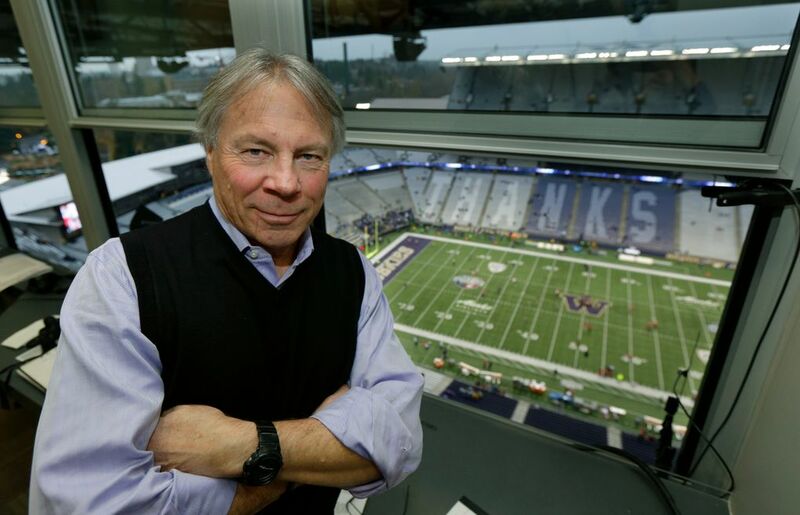 Bob Rondeau refused to make his final game at Husky Stadium a sad day. “I never was going to shed a tear today, I promise you. It was always going to be really fun like Apple Cups should be,” he said. 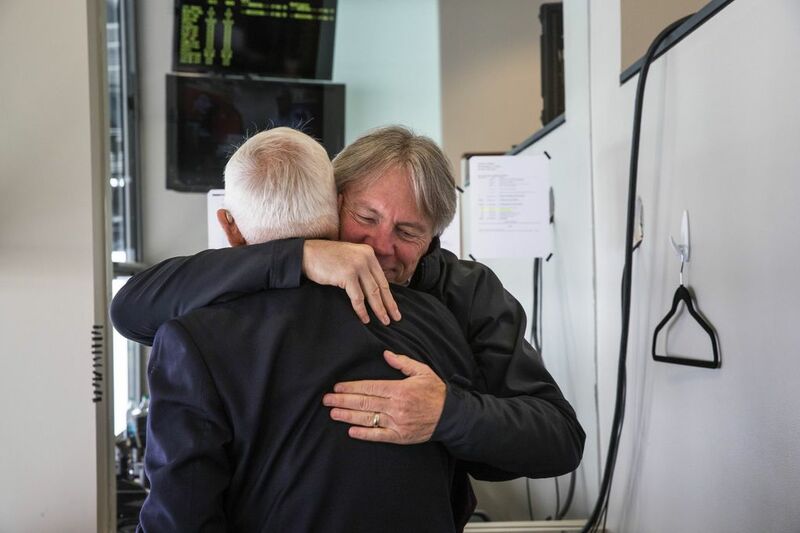 Bob Rondeau arrives a little earlier than normal on his last day of work at Husky Stadium. Normally he gets there two hours before kickoff, but this day is different. The 67-year-old iconic sports broadcaster pulls into the parking lot at 1:30 p.m., 4½ hours before Washington and Washington State kick off. 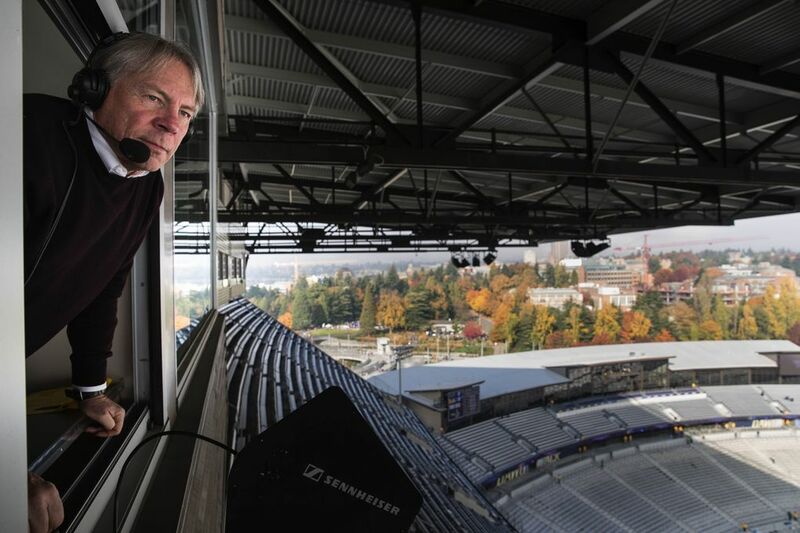 Rondeau, a journalism graduate from the University of Colorado, never imagined he would spend 37 years as the “Voice of the Huskies” and provide an unmistakable radio soundtrack for some of the greatest moments in Husky history to generations of UW football fans. From Jacque Robinson to Dante Pettis, from Don James to Chris Petersen, and from an undefeated co-national championship season in 1991 to a winless 0-12 campaign in 2008, Rondeau has witnessed the rise, fall and resurrection of Husky football. And now he’s retiring while the program is soaring again. He’ll call one last game Dec. 30 when No. 12 Washington (10-2) faces No. 9 Penn State (10-2) in the Fiesta Bowl at the University of Phoenix Stadium in Glendale, Ariz.
During his final game at Husky Stadium, Rondeau — who abhors the spotlight — reluctantly allowed us to follow him and chronicle a special day filled with emotional send-offs, tributes and another UW blowout victory in the 110th Apple Cup. 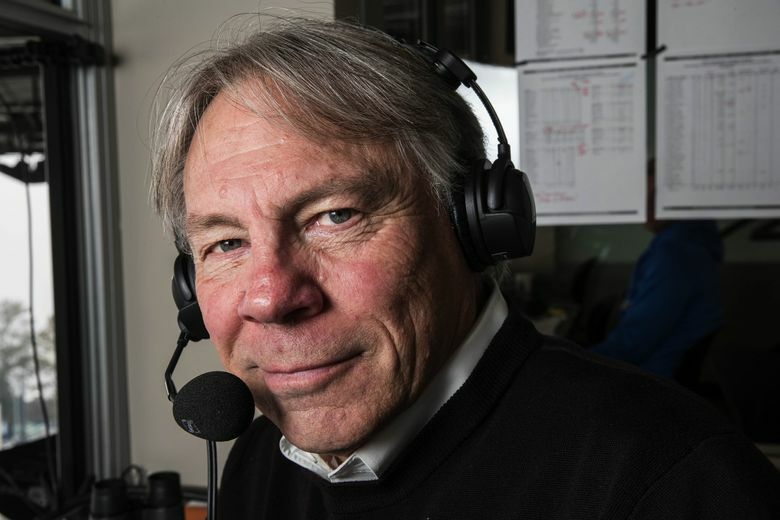 Bob Rondeau, the voice of the Huskies for 37 seasons, is retiring. 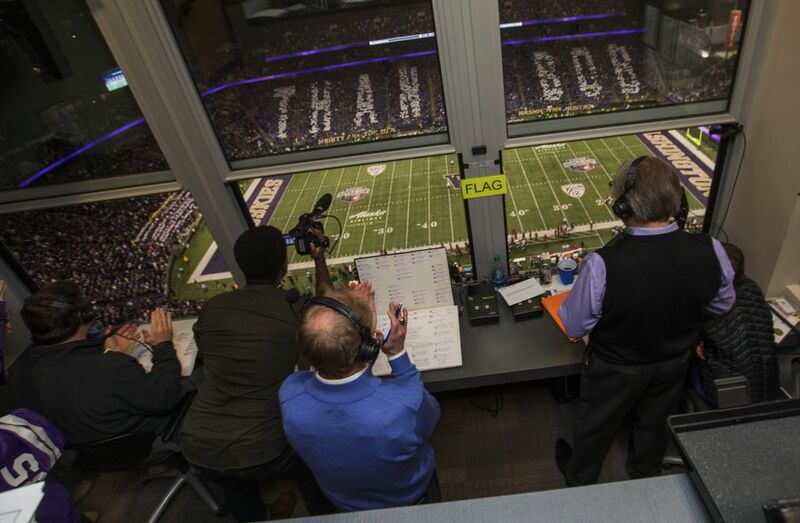 Catch a glimpse into the sights and sounds of his last broadcast at Husky Stadium (Ben Arthur / The Seattle Times). 2:07 p.m. — Rondeau joins Greg Lewis, Keith Gilbertson, Bill Swartz and Tom Hutyler on the Husky tailgate pregame show and insists this day isn’t about him, even though a King County proclamation deemed Nov. 25, 2017, as “Bob Rondeau Day.” Each of the men has known Rondeau for years and share stories about him. It’s starting to get a little emotional, but Rondeau is having none of it. 2:23 p.m. — Rondeau works his way into Husky Stadium and walks past dozens of boxes with talking Rondeau bobbleheads that will be given to the first 10,000 fans. It’s one of many surprises on a day that will leave him speechless and humbled. He began to understand the impact his retirement is having when UW coach Chris Petersen asked if he would address the team in the locker room early in the week. 2:45 p.m. — Inside the radio booth, Rondeau is prepping for the game when Damon Huard walks in. In 2010, the former UW Husky quarterback took over as color analyst, replacing former UW kicker Chuck Nelson, who worked from 1994-2009 next to Rondeau. Admittedly, Huard struggled during his first season, like any newbie. Sometimes he talked too much and other times he didn’t say enough. Huard credits Rondeau and younger brother Brock Huard, an ESPN color analyst and radio talk-show host, for teaching him the nuances of the broadcast business. Damon Huard and Rondeau share a playful off-air relationship and after eight seasons, they’ve developed a comfortable rapport on radio. 3:10 p.m. — Rondeau pops into the Washington State radio booth to visit with legendary broadcaster Bob Robertson. Last year, Rondeau received the Chris Schenkel Award, which is given in recognition of distinguished careers broadcasting college football. He became the fourth recipient with ties to the Pac-12 Conference, joining Robertson, Colorado’s Larry Zimmer and California’s Joe Starkey. Since announcing his retirement in April, the 2016 Husky Athletics Hall of Fame inductee has been loath to embark on a farewell tour, but he was feted with cake at Colorado and Arizona State. Still, he’s made it a point to connect with fellow broadcasters, and spending a few moments with Robertson and WSU play-by-play announcer Matt Chazanow is a treat. 3:43 p.m. — UW sideline reporter Elise Woodward checks in with Rondeau before heading down to the field. She’s one of the newest members of a six-person crew that includes producer/spotter Tom Freal, statistician Travis Sherer and engineer Terry Ryan, who runs audio equipment. “Are we pretty sure that it’s the Alamo Bowl with a win?” Woodward asks. Later, she describes Rondeau as a mentor who helped her develop a career in sports broadcasting. “He’s the best and he’s a legend, but he’s treated me like an equal since I was a little intern way back in the day,” says Woodward, a former UW basketball player. “He’s the sweetest and nicest guy and he doesn’t have to be. He treats everybody with so much respect. That’s why I love him. He’s a pro at everything he does. He’s awesome. 4:31 p.m. — Molly, Rondeau’s wife of 20 years, stops by the booth with their grandson, Joseph. She spent the past three hours tailgating under a constant downpour on a 49-degree evening with about 30 family and friends. “That’s how it should be every game,” Rondeau replies. Husky Stadium, where they married at the 50-yard line on July 26, 1997, holds special memories for them. And college football binds them and brought them together. Molly tells the story of when they met in 1993 in the Arizona State press box. They were introduced by Rondeau’s old broadcast partner, Sam Adkins, the former Seahawks quarterback. 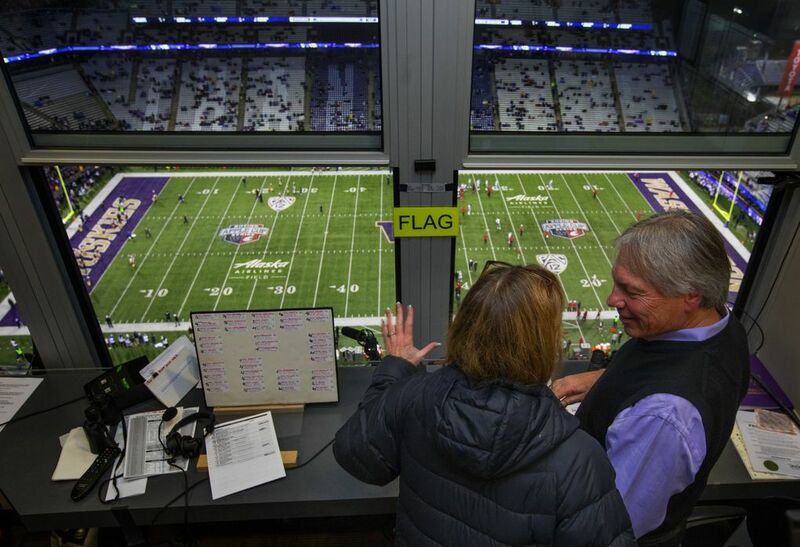 Adkins asked Molly and a girlfriend to work a UW-ASU game as spotters — an assistant who helps broadcasters in the booth — but Rondeau was initially hesitant. They dated for four years before Rondeau proposed on a drive back from an UW-Oregon men’s basketball game. If it were up to Rondeau, it would have been smaller than 300 guests. And they don’t necessarily agree on this retirement thing either. “If it was up to her, I’d probably do this to the day I die,” he says. They’re planning on visiting great college football venues, such as Wisconsin and Ole Miss. Retirement will also allow Rondeau to focus on his hobbies, including fly-fishing, gardening and cooking. There’s also the possibility that he’ll delve into horse racing — his father, Bill, owned a horse farm near Phoenix. 5:07 p.m. — Purple smoke. The siren shrieks at Husky Stadium and Jimi Hendrix’s “Purple Haze” blares on the stadium speakers as UW players run on the field. Nine-year-old Joseph, the oldest of three grandchildren, settles next to Rondeau in the corner. He’s been coming to games since he was 2, and this season he has been a regular. 5:22 p.m. — On Washington’s first possession — an 11-play drive that covers 75 yards — running back Myles Gaskin does much of the work, and the Huskies are at the WSU 2-yard line. 6:43 p.m. — With a minute remaining in the first half, the Cougars march to the UW 34-yard line on their most promising drive when disaster strikes quarterback Luke Falk, who has been pressured and harassed all night. The Huskies lead 24-0 at halftime. During intermission, the Husky band lines up in a formation spelling Rondeau on the field. 7:21 p.m. — UW athletic director Jen Cohen, associate athletic director Carter Henderson and a Pac-12 Networks camera crew enter the booth, which now includes about 20 family and friends crowded in the back of the room. Cohen beams as she announces Room 807 in the press box will be renamed the Bob Rondeau radio booth. 8:13 p.m. — After Gaskin scampers in for his fourth touchdown, Rondeau signals to Sherer and Freal to find the Apple Cup rushing record. Gaskin finishes with 197 yards, well shy of the 296 yards Husky great Hugh McElhenny had in 1950. “It would be fun to get him back for his senior year,” Rondeau says while speculating if Gaskin, a junior, will return next season. “Be a good Christmas present,” Huard says. “Yeah, good luck,” Rondeau quips. 8:35 p.m. — Final score: Washington 41, Washington State 14. The booth explodes in cheers and applause. Molly plants a kiss on Rondeau, Joseph gives his grandpa a hug and Huard pats him on the back while offering Champagne. Rondeau declines, saying he needs to finish the postgame show, which includes an interview with Petersen, who dedicates the win to Rondeau. 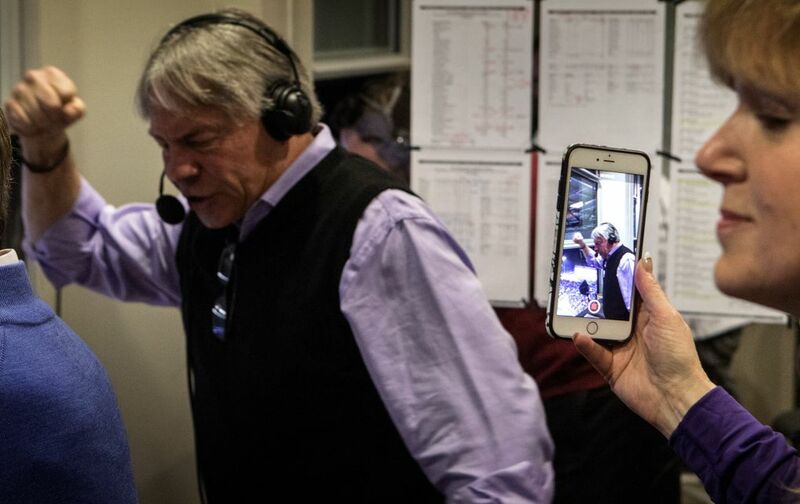 9:23 p.m. — Rondeau wraps up his final Apple Cup broadcast by thanking individually the six-person crew, which he says is his family. 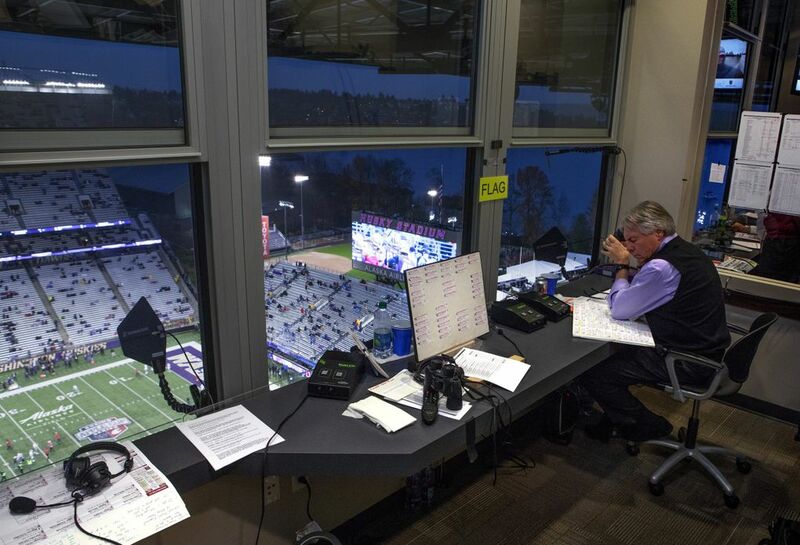 “I will never forget what has happened this week and this night as we have our next-to-last Husky broadcast,” he says. “Damon, I want to give a huge thanks to you. Elise Woodward is up here as well and all the people who work on the team, and it truly is a team effort indeed. My man Tom Freal right next door to here has been our spotter/producer in house for many years. This stuff doesn’t happen without Tom. It doesn’t happen without our stat guy Travis Sherer, who is magnificent with the numbers all night long. Our engineer Terry Ryan is absolutely the best in the business. It’s so much fun to have family here to go through all of this and I know I have a ton of family out there in the listening audience as well. It has been absolutely magnificent. 9:29 p.m. — The show is over and Rondeau cracks open a Coors Light. For the next hour, he accepts hugs, well-wishes and swaps cherished stories with some of the most important people in his life. During a quiet moment, he admits to being exhausted, but he wouldn’t change anything about this day. Rondeau is at the center of it all, a strange place for someone who shuns the spotlight. “It’s not a sad day,” he says. “People kept wanting to make it a sad day, but it’s not. It’s a celebratory day. It’s how lucky we are to have been able to do this for this long. It’s awesome.